Recently, I swapped out the video card on one of my machines, and at the same time bumped up the memory by adding another two GB of RAM. A fairly simple operation which was followed, unfortunately, by a not so simple series of BSODs, system lockups, failure to boot, and the usual – “what’s going on here”, frown. All of these problems were intermittent, and I eventually solved the issue by re-swapping components in and out. In the end, the culprit was a bad piece of RAM (actually, a RAM compatibility issue). While going through this mildly frustrating experience, I got a bit of a test on my knowledge of BIOS beep codes. I have to admit – I barely got a passing grade. But, as it turns out, there was an upside to this exercise – I found a nice piece of free software which is designed specifically to translate BIOS beep codes; displayed in a very functional GUI. 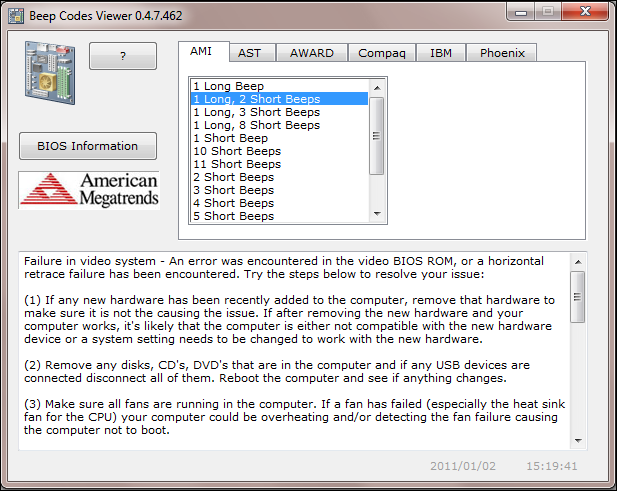 Rizone Beep Codes Viewer 0.0.1.168, is a simple portable tool (save it to a USB stick), that will explain the BIOS error beep codes for all the main PC BIOS manufacturers (AMI, AWARD, Phoenix, IBM). Following the application launch, click on your BIOS type – select the beep code, and you’ll be provided with a detailed diagnosis of the problem; including a recommended solution. System requirements: Windows 2000, Win 7, Server, Vista, XP – (32 and 64 bit). This is a terrific free application and a worthwhile addition to your troubleshooting tool box. Happy to hear you have a use for this application. You’re right, the portability factor is a big bonus. Thank you sir Bill for bringing up this software. 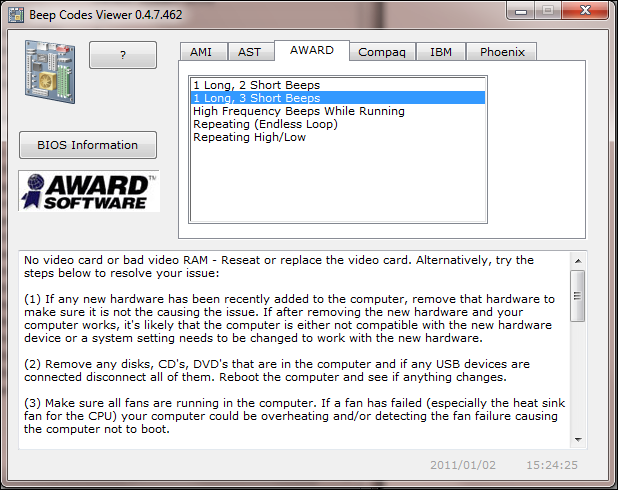 Very handy, and I’m to lazy to look at every BIOS manufacturer’s beep codes :D. Now I see all the manufacturer’s code in one application. Used in the right circumstances, this application will definitely save some time. Good to have it handy on a flash drive, for sure. Bill – Thanks for this one – I had a similar experience to you – was fiddling around upgrading RAM – and on startup – beep beep etc etc – groan – sigh – bang head on keyboard – usual routine – had to fire up another system – spent seemingly forever hunting around on Google – eventually found the info – but cannot believe I’ve never heard of this little beepcode file before. Thank you Bill. Good job. Best regards / David. If the BIOS won’t load, and assuming there is power to the Motherboard, then as a high end user you know the 3 or 4 issues that need to be looked at – from incorrectly seated components, on out. This application is designed to respond provided the BIOS does load.